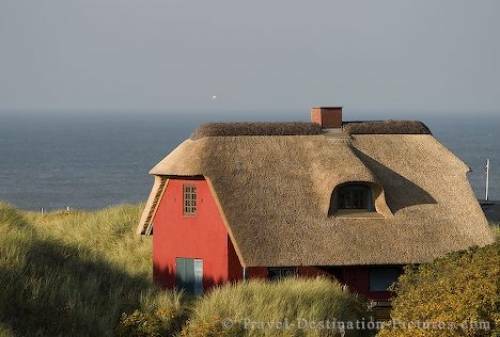 A quaint thatched roof cottage overlooks the North Sea in the town of Henne Strand, Jutland, Denmark. Henne Strand is a little town in Jutland, Denmark, right in the middle lying at the coast of the North Sea. Very touristic, it is a very nice little town for some vacation - and especially for photographing. Sun, sea and weather are producing various moods of light, especially in the evening. These houses with thatched roofs make great objects as are the dunes and the sea. You can visit the quaint town of Henne Strand in Denmark at any time of the year, these pictures where taken in the end of october. Picture of a thatched roof house facing the North Sea in the town of Henne Strand, Jutland, Denmark.